Hello, I'd really like to improve the red marks on my nose and I really do not have a clue what to do. I've never used any facial products in my life because of the vast amount of selections available. It really is a daunting task to choose, in my opinion. I'm an asian male with very sensitive skin. When I was 14-15, I got sick of having blackheads and started popping them, boy do I regret it. After popping several blackheads, a big fat pimple popped up on my nose and it was embarrassing so I popped it and as a result, faced with a red mark on my nose. 2nd picture is 2 months back. It may not look that bad on photo due to shadows, but it looks hideous in real life. Are you sure it's not a scar? Judging by the photos it looks like it's indented to me. I would say a good product to use to fade red marks is apple cider vinegar, which you can find in many supermarkets and shops next to the normal vinegar. I would say you should start off using a solution of 3 parts of water to 1 part of AVC, once a day and see how your face handles it. hey your scar look like indented dude..its kinda deep..
hmm, maybe its because the viewing angle from the top. 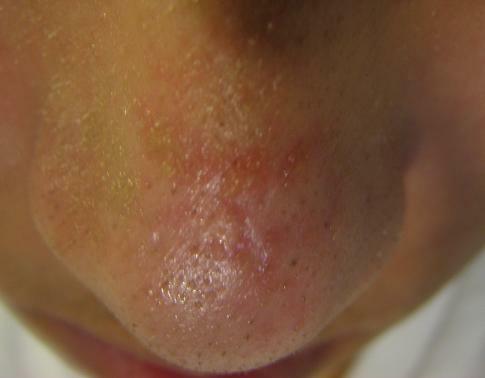 Maybe its rosacea, I really have no clue. I'll try the apple cider. Thanks. ps: If it really is indented, what do you suggest I should do?